Bouncing back strong from its poor debut, Alaska listed its first win of the season after mercilessly annihilating Columbian Dyip, 94-72, to impress in the 2019 Philippine Basketball Association Philippine Cup at the Mall of Asia Arena in Pasay City last night. Alaska’s Chris Banchero prepares to make his move against Columbian Dyip’s CJ Perez in a PBA Philippine Cup game won by the Aces, 94-72. Carl Bryan Cruz had his best game of the conference thus far, turning in a season-high 20 points and nine rebounds for a near double-double performance to backstop the Aces. Jake Pascual likewise continued his rise, coming off the bench to drop a double-double with 13 markers and 13 points for more production while Ping Exciminiano added 12 points, also as a reserve. The Aces improved to 1-1, while the Dyip suffered their third straight setback, sliding to a 2-4 slate in the lower echelon. 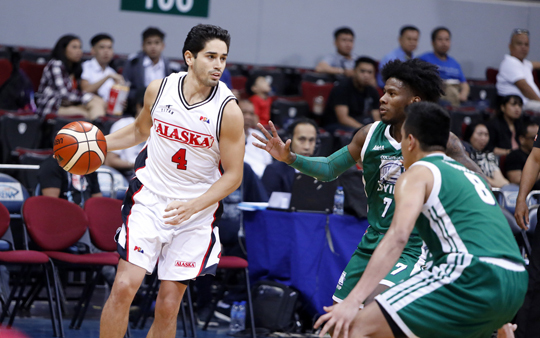 A booming 18-6 run bridging the first two quarters gave Alaska some much needed separation as the Aces opened up a sizeable 32-18 spread after Jeron Teng’s completed three-point play capped the blitz. Alaska headed to a double-digit lead, 46-36, at the half. A follow-up 14-6 run midway in the third enabled the Aces to re-establish a bigger lead, 64-46, at the 5:04 mark and completely ran the Dyip out of the building for a methodical triumph. The Aces’ lead apexed at 30 points, 91-61, with 2:41 remaining after a lay-up from Davon Potts. Alaska’s reserves took a lot of the scoring cudgels to lead the team to victory. In total, Alaska drew 48 from its bench mob. Columbian Dyip was unable to recover from its early struggles as Alaska was on point with its attack on both ends of the floor. CJ Perez led the Dyip with a team-high 15 points in the losing effort. Alaska 94—Cruz 20, Pascual 13, Exciminiano 12, Banchero 10, Potts 9, Teng 8, Ayaay 8, Baclao 6, Thoss 4, Galliguez 4. Columbian 72—Perez 15, Corpuz 12, Khobuntin 8, Cabrera 6, Reyes 5, Escoto 5, Gabriel 5, Cahilig 4, Camson 4, Calvo 4, McCarthy 2, Tabi 2, Agovida 0.